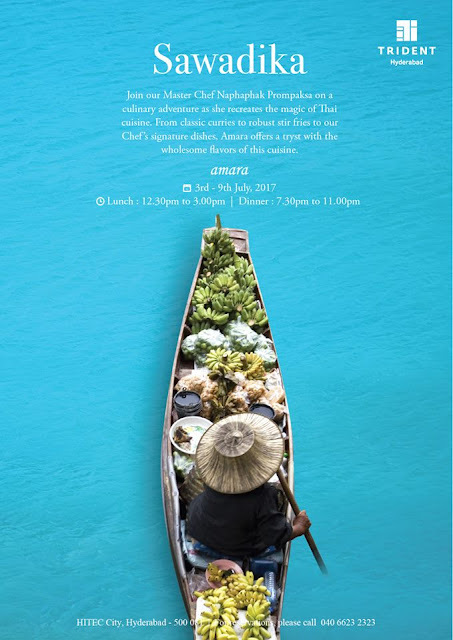 The festival is curated by Chef Naphapak Prompaksha from Thailand, who is currently working with Rim Nam, the Thai restaurant at The Oberoi, Bangalore. Chef Tam, as she is known, seemed extremely enthusiastic, and she personally explained many of the dishes to us. She even prepared her special Thai Green Curry for us to taste. Invited for a preview of the festival, I first had a look at the buffet. 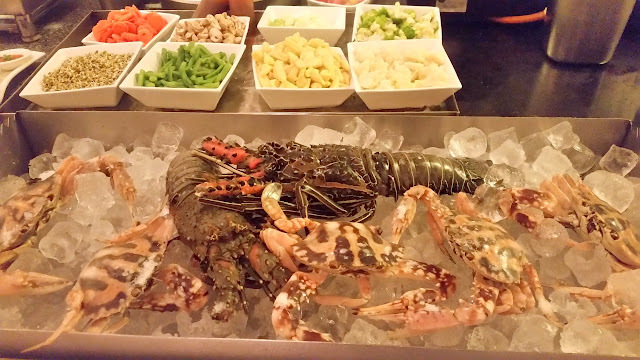 The restaurant had a live counter, mainly serving seafood, and the huge lobster there had me drooling. 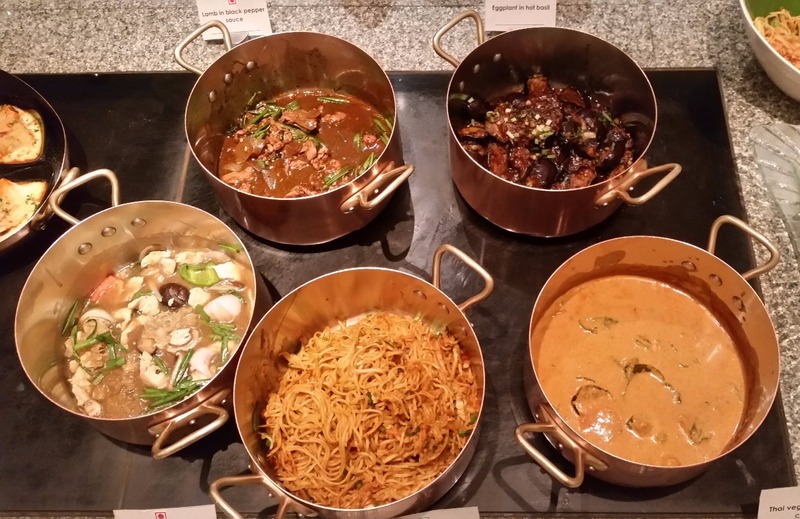 The buffet had quite a few of Thai dishes, Chicken in Ginger and Mushroom Sauce and Lamb in Black Pepper Sauce looked interesting to me. I was told that Amara is also offering a set menu as well as a-la-carte Thai dishes for this promotion. Usually, I am not a big fan of food festivals in all-day dining restaurants of star hotels. 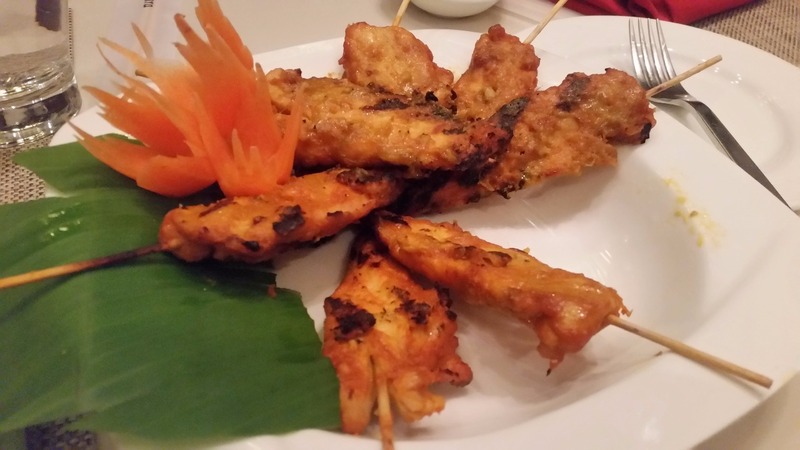 Often, as they have to cater to their in-house guests who may not be interested in festival food, they end up only having a few items of the promotion in the buffet. An additionally offered set menu takes care of this problem and allows the food lovers to enjoy a complete meal from the promotion. For the preview, the set menu was presented to us. 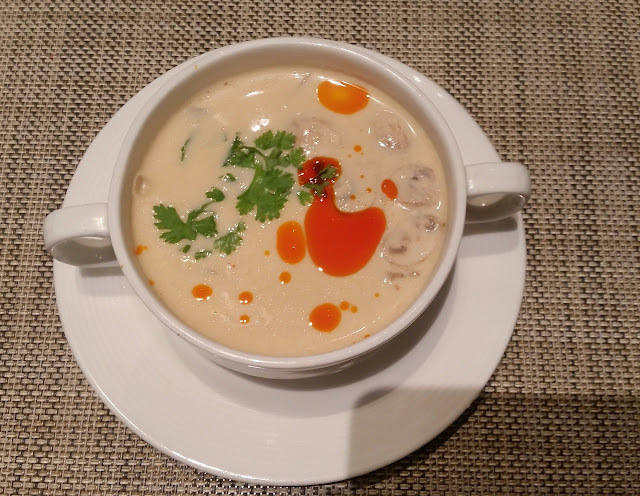 We had the choice of two soups Tom Yum and Tom Kha. I went for Tom Yum Goong, the tangy and hot signature soup from Thailand. Tom Kha was the coconut based Thai soup which was also available with either chicken or prawn. 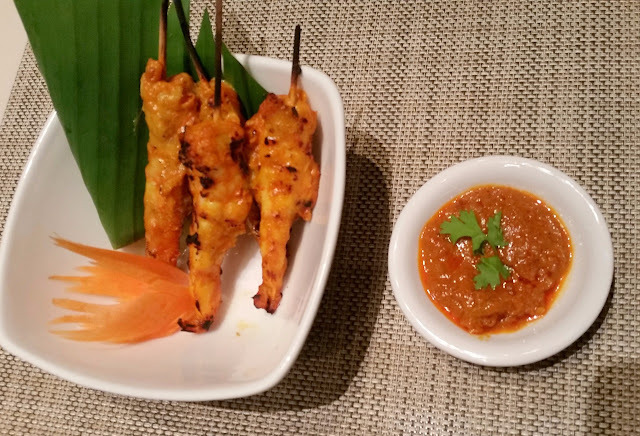 My favourite from the starters was the Chicken Satay – grilled chicken on sticks served with a delectable peanut sauce. A variant of this with prawns was also served. 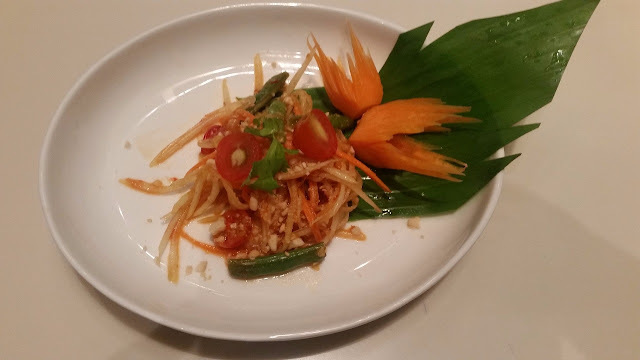 Som Tam, the Thai papaya salad was just as it should be - spicy and delicious with the Bird’s Eye chillies and peanuts. The other salad was Yum Hed, mixed mushroom salad with chillies and Thai lemon sauce. Chef Tam’s mastery was even more visible in the main courses. 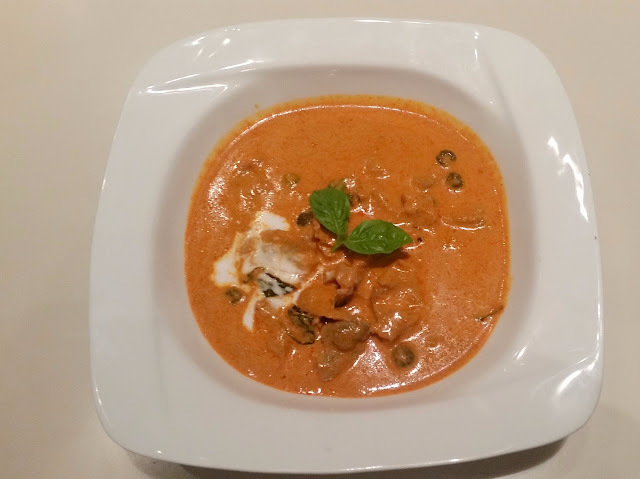 Gang Dang, the Lamb, and vegetable based Thai red curry was easily one of the best I have had. The curry soaked Jasmine Rice was so flavourful that it definitely called for a second helping. 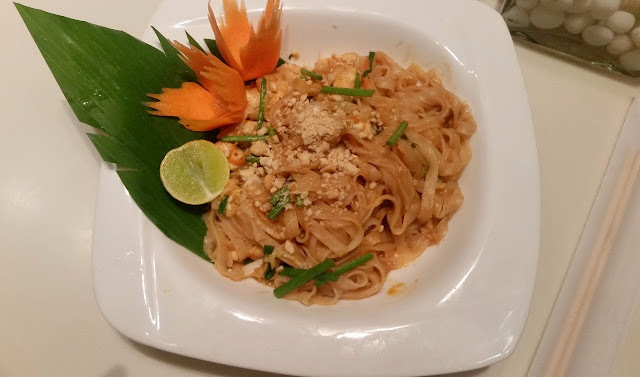 Prawn Kra Paw was the other main course – the soya sauce and basil based gravy was served with Pad Thai. 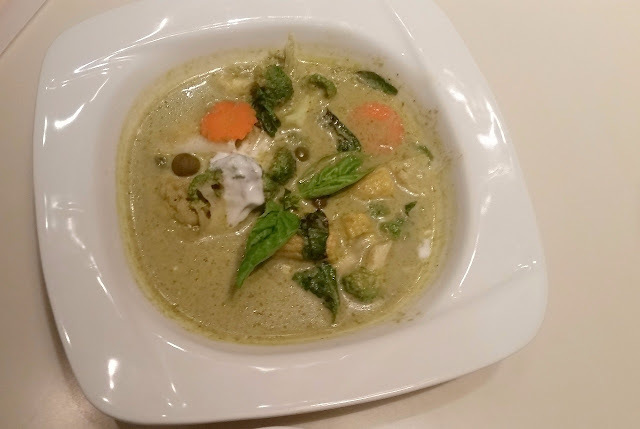 As previously mentioned Chef Tam’s Thai Green Curry was delicious as well. 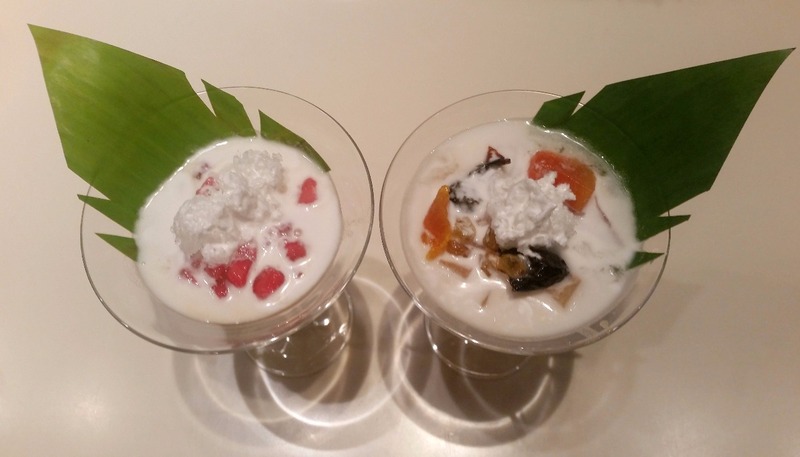 For dessert, there was Tub Tim Krob, with crunchy water chestnuts in sweet coconut milk. This is one of the popular Thai desserts, delicate and not overly sweet. Rohm Mit, with fruits and nuts in carnation milk, was something I had never tried before, and I was very impressed with the taste. The promotion is on until 9th July, for both lunch and dinner. While the buffet priced at Rs 1300 plus taxes is economical, I would wholeheartedly recommend the Set Menu (Rs 2100 plus taxes) for lovers of oriental cuisines. Hyderabadis will also enjoy this spicier version of Thai food. A festival which surely not to be missed.